* $10 daily and $50 season additional fee for tow behind car or trailer. Parking permits can be purchased at the Main Office through August 3 and at the Pass Office beginning TBA. You will receive parking coupons for the day(s) you will be staying. You will also receive a window hanger with the dates punched that you will be staying. The lots will be checked daily to see if your pass is current. If not visible or current, your vehicle may be towed. Your daily payment allows you to stay until 9:00 am the following morning. 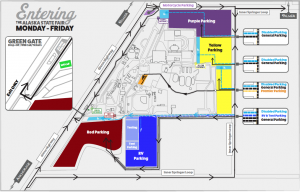 RV Parking sellers will collect from after-hour arrivals at 8:00 AM – Cash only. Quiet time is 11 pm to 8 am. No Generators, loud partying or music which is disturbing to your neighbors. Outdoor cooking and campfires are not allowed. Any patron burning a fire will be asked to leave the property and no refund will be given. A 16 foot wide bay space is allowed. Allow 4 feet between you and your neighbor. Only extend awnings 4 feet. There will be 24 hour security on site so please follow all regulations. The parking lot and RV lot are dangerous places for kids to play. Please restrict children’s activities in the lot. Do not tether your pet(s) outside your vehicle when you are away from your RV. All pets must be on a leash. Unattended pets found tied outside will be removed by the proper authorities. All animal waste must be picked up immediately. Pets are not permitted inside the Fairgrounds. Please pick up your trash and place in the provided trash containers. Trash left behind hinders others enjoyment of the area. All campers must have a Tent Permit. Quiet hours enforced from 11:00 p.m. to 7:00 a.m..
Registrant must be at least eighteen (18) years of age to register for a tent site. Site holders are responsible for the actions of others at their tent site. No alcohol is allowed outside of the tent. Each tent site has space for one (1) two to four man tent. Only one (1) tent per site. Grouping tents together is NOT Permitted. Tent Permit MUST be in a visible position to avoid being evicted. Pets are not permitted inside the Tent Camping Lot. Campers must remove all liter/trash upon departure. Handicapped-accessible parking is available at the Red, Yellow and Purple Lots, which offer the closest entrance to the fairgrounds. For pedestrian safety, parking on the Glenn Highway or right-of-way by the fairgrounds is not allowed. These areas will be closed off and clearly marked “no parking.” Any vehicles parked there will be towed.